This week, we speak to composer Andrea Clearfield (2016), who creates deep, emotive musical languages that she says, “synthesize disparate elements into a musical whole” and “build cultural and artistic bridges.” Over the last 30 years, Clearfield has composed more than 125 works for orchestra, chorus, chamber ensemble, dance, and multimedia collaborations, exploring subjects ranging from freedom and oppression, to ancient cultures, religion, health, and technology. She has been a fellow at the American Academy in Rome, and has held residencies at the Rockefeller Foundation’s Bellagio Center and The MacDowell Colony. A winner of the 2016 Global Premiere Commissioning Competition, Clearfield is founder and host of the Philadelphia Salon, a monthly performance series established in 1986. I was drawn to music early. At age five I was figuring out tunes on my mother’s piano that I had heard in school. My parents gave me piano lessons shortly after. As an adolescent, I remember being so taken by a young André Watts’ riveting performance of Rhapsody in Blue at the Academy of Music that I decided that I would dedicate myself to music. 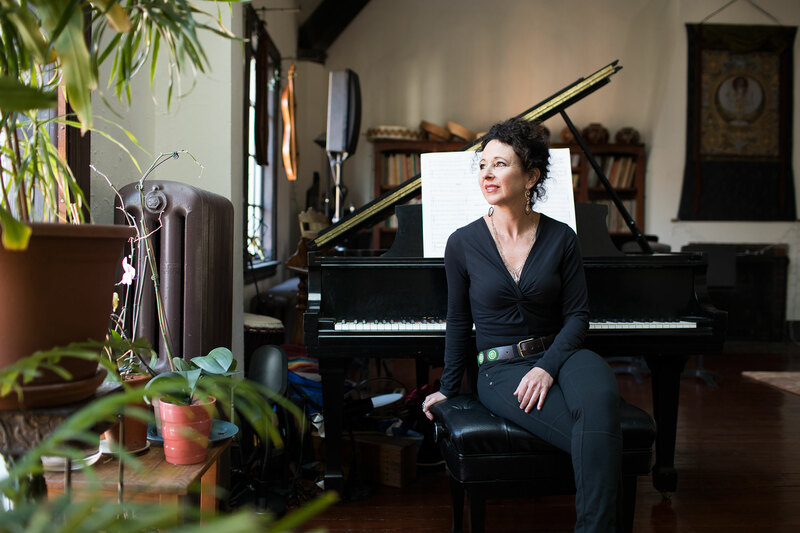 And although I pursued piano performance through graduate school, I was always composing, arranging, and exploring different types of music: classical, rock, jazz, improvisation, and world music. It wasn’t until I had the great fortune of meeting Margaret Garwood in undergraduate studies that I thought of myself as a composer. Margaret, a successful composer of opera and a woman of great integrity, was an important female role model and mentor to me for almost 40 years. She was the first to encourage me to follow my compositional voice. That seminal relationship helped me to refine my interests towards a more compositionally creative impulse from a more interpretive one. You’ve toured internationally and your work has been performed widely in the U.S. and abroad. In your experience, what makes the Philadelphia arts scene distinctive? I feel that there is a true sense of support amongst composers and other artists here in Philadelphia— and especially now as we come together post-election to put our work out there even more strongly. A big city, yet within the arts scene there exists a personal feeling of neighborhood-like community and a fertile ground for creative resourcefulness. Another distinction is the strong arts support from the Pew Center, which provides a rare and invaluable gift to our city and beyond. You’re currently writing your first opera, MILA, Great Sorcerer, based on the life of an 11th-century Tibetan yogi, and you previously traveled to Lo Monthang, Nepal to research and document the area’s indigenous Tibetan folk music. What drew you to this line of research and how has it influenced your recent compositions? I was led to this remote area of northern Nepal through a commission from Network for New Music. In 2008, artistic director Linda Reichert was pairing composers and visual artists: artist Maureen Drdak and I were chosen to collaborate. Maureen invited me to join her on a trek to a restricted area of the northern Nepalese Himalaya where she was researching Tibetan iconography. Upon arrival, via 10 mountain passes and several days on horseback, I was encouraged to record the royal court singer of Lo Monthang, Tashi Tsering, who knew a repertoire of court songs (gar-glu) that had been passed down aurally for hundreds of years. With no heirs to learn his music, the songs would be lost. Recording Tashi Tsering and studying Tibetan Buddhist ritual music in 2008, and subsequent fieldwork in 2010, inspired a new body of work. These pieces meld large-scale forces (chorus, chamber orchestra) with electronically treated field recordings and integrate rhythms, melodic ornaments, and instrumental textures of Tibetan folk and religious music into my contemporary language. They also delve into more abstract liminal sound worlds and slowly evolving development than my other works. Ultimately, the experience of working with the community in Nepal strengthened my belief that the world connects through the global language of music and arts. During these turbulent and divisive times, this connection seems more important than ever. A night owl, I do my best work from late afternoon until 2 a.m. In the morning, I love a big mug of dark roast coffee, get business out of the way, take a noon yoga class to clear the mind and body, and start composing at about 3 p.m. I generally work on one piece at a time; however, if the pieces are in different stages of completion, I may split up the afternoon and evening to work on two (for instance, if one is in early sketch and another is in the orchestration process or has an electronic component). I have been writing at the piano with pencil and manuscript paper and later using Finale engraving software; I am now wanting to work more at the computer. I also spend some time engaging in pre-compositional research for new commissions—listening, studying scores, seeking poetry and texts, and reading about related subject matter (for cantatas and other vocal works). Margaret Garwood always told me to listen deeply inside. This reminder to be quiet, receptive, and attentive to what music absolutely needed to emerge, in what form, and with what musical “color” was invaluable. This advice was particularly helpful when problem solving within a piece, since it involved trust that the answers would come from perseverance, personal exploration, and patience. Music by contemporary composers Mason Bates, Kaija Saariaho, and Andrew Norman. Portrait of an Artist: A Biography of Georgia O’Keeffe by Laurie Lisle, and Georgia O’Keeffe: A Life by Roxana Robinson. Upon recently returning from three months in Taos, NM as a Wurlitzer Fellow where I was inspired by the land and Georgia O’Keeffe’s home in Abiquiu, I felt moved to re-read these biographies. Perfection is not normally a word that I use in reference to my work since the process is so fluid—so I am substituting “completion”: When the musical structure and the musical materials unite seamlessly to create a cohesive whole; when risk-taking and working with self-imposed challenges produces materials that are not only new and unforced but are inherently connected to the structure; and when, after all of the working-out, there is a feeling of expansiveness, emotional communication, and opening of doors. The latter is something that comes as a visceral sensation rather than an intellectual knowing.